I'm not usually a fan of moralistic picture books. I tend to find them to be trite. In almost every case, when offered such a title for review, I pass it up. However, in the case of The Grudge Keeper I was intrigued. The cover art helped draw me in and I thought that maybe, just maybe, this one would be worth reading. I'm glad that I didn't pass this title up because author Mara Rockliff obviously took some pains to tell a complex story about an entire town who didn't exactly keep grudges but didn't dismiss them either. Whenever one person took offense by another, they would write up their offense on a piece of paper and leave their complaint with Cornelius, the town Grudge Keeper. Cornelius' house is positively filled with organized pieces of paper documenting everyone else's offenses. Then one day a wind storm comes along causing disorder and confusion of all of the papers in his home. The town's people view the damage and suddenly realize just how many grudges are being stored away rather unnecessarily and they purpose to clean up the mess. In the end, Cornelius is relieved of his duties as the town's grudge keeper for the simple fact that his services are no longer required. "What with overflowing cupboards full of friendliness, shelves stuffed with smiles, and tabletops heaped high with hugs, he simply didn't have the room." 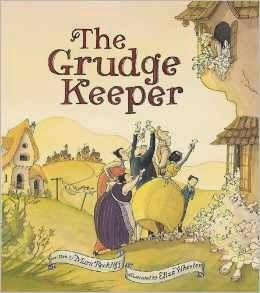 The illustrations by Eliza Wheeler do justice to the story and she helps to give the book a more folk-tale-ish feeling. I think this book is very nicely done. I didn't feel as if the message of this book was forced upon the readers. At the same time, I didn't feel like the message was completely buried for only the most observant to realize. I really found it to be quite balanced in its approach and I'm glad to have read it. I also feel no qualms in recommending this one to you. Better still, I'm happy to say that I have a copy to give away to one of you! Peachtree Publishers has offered one copy of this book to one U.S. Resident. To be entered into the giveaway, simply leave a comment below including a valid e-mail address. This contest will be open through next Monday, April 7th. THIS CONTEST IS NOW CLOSED. THE WINNER (as selected by Random.org) is #10 - TRAVELER Congrats! Many thanks to Peachtree Publishers who sent a copy of the above book my direction in order to facilitate this review. I received no additional compensation for this post and all opinions are my own. For another opinion of this book, check out Chat with Vera. I like the cover art, too. Oh, I think this could be a keeper! Too many, "Then I'll never play with you again" in my home. I love the sound of this book! :) It kind of reminds me of some of Max Lucado's books for children. P.S. If Amy (theycallmemommy) wins, I might have to fight her for it. ;) HA! I got this one through netgalley(for my kindle), but the formatting is so off, I'm trying to figure it out. I really like it from what I can tell, though. And, I love the pictures. Sounds intriguing. and helpful with even grown ups getting over petty things against each other. This looks like a fun way to learn an important lesson!